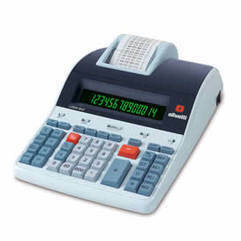 The Logos 804T is the Olivetti printing calculator designed for intensive use, featuring a fast thermal printer which guarantees clear printing along with a reduced noise levels. advanced functions: cost, sell, margin and Call-and-Void to display and correct the data entered. Both its ergonomic keyboard and back-lit display, with extra-large characters, guarantee a high operating comfort.